The Benyounes Quartet is gaining a reputation as one of the most engaging, dynamic and successful young quartets to have emerged from the UK in recent years. 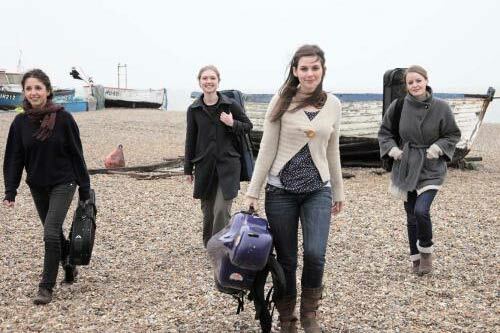 Formed in 2007 at the Royal Northern College of Music, they were winners of the 2012 1st International Sandor Vegh String Quartet Competition in Budapest and 2nd prize winners at the 2014 Orlando International String Quartet Competition, and were recently selected for the Wigmore Hall International String Quartet competition. This season the quartet will curate a series of concerts in collaboration with ‘Women of the World’ Festival which explores neglected female composers. Rebecca studied at the Universität Mozarteum in Salzburg before winning a prize in the Lionel Tertis International Viola Competition. She also received a ‘star award’ from the Countess of Munster Musical Trust. Sarah studied at the Royal Irish Academy in Dublin and at RAM in London where she became deeply committed with historic performances. Rebecca and Sarah are the violist and cellist of the Callino Quartet, a group founded at the West Cork Music Festival which enjoys a high profile in Ireland as well as regular festival appearances across Europe. They have recorded 3 commercial discs and will soon release their reading of Haydn’s Seven Last Words on the Cross. Besides chamber music, they both have leading roles with London’s best chamber orchestras including the baroque group Arcangelo under Jonathan Cohen.